New DIRECTV customers subscribing to NBA LEAGUE PASS, as well as existing DIRECTV Bar and Restaurant customers who did not purchase NBA LEAGUE PASS for the previous season (2014-2015) are eligible to take advantage of this NBA LEAGUE PASS mid-season offer for a limited time between 1/18/16 and 3/13/16. With teams raising their level of play to make the playoffs, this is a great time to catch all the action. NBA LEAGUE PASS delivers up to 40 out-of-market games per week! DIRECTV gives you the marketing power you need to promote NBA LEAGUE PASS at your bar or restaurant. 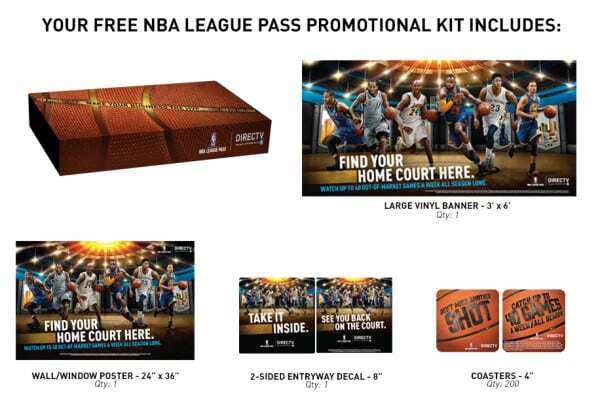 With banners, posters, coasters, and decals available to help you market the NBA to your customers. DIRECTV Public Viewing customers will receive a free Promotional Kit and 150 credits to use on DIRECTVMVP.com! For 2015-16 NBA LEAGUE PASS Mid-Season pricing, click here. For the NBA LEAGUE PASS Mid-Season Profit Calculator, contact us at 800-951-1979. Dont Have DIRECTV for Your Bar or Restaurant Yet? Call Barry at 800-951-1979 Today! NBA LEAGUE PASS OFFER: To receive NBA LEAGUE PASS, a DIRECTV commercial subscription to a base programming package is required. Programming charges based on Fire Code Occupancy (FCO) based on segment. Customers must order by 3/16/16 and activate by 4/13/16 to be eligible for the 1-Pay option. IN THE EVENT OF AN EARLY DISCONNECT, THE REMAINING BALANCE OF NBA LEAGUE PASS WILL BE CHARGED TO CUSTOMER’S ACCOUNT. LIMIT ONE NBA LEAGUE PASS OFFER PER ACCOUNT. NBA LEAGUE PASS continues automatically provided DIRECTV carries this service, unless the customer calls 1-866-771-1523 to cancel prior to the start of the season. Programming, pricing, terms and conditions subject to change at any time. NBA, the NBA logo and team identifications are the exclusive intellectual property of NBA Properties, Inc., and the respective member teams.